Tactics and combinations are an essential part of chess. 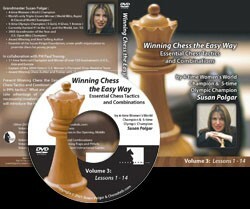 In this DVD, Susan Polgar will introduce to you the most common tactical elements in chess such as forks, pins, skewers, discovered attacks, double attacks / checks, removing the guard, checkmates and more. Susan has composed most of the 64 exercises problems that will teach you her unique way to learn pattern recognition. Tactics can and do happen in all parts of the game, in the opening, in the middle game as well, as in the end game. In each element we will see one move solutions first and then move on to two and three moves combinations.So sit back and let the 4-time Women's World and 5-time Olympic champion train you.